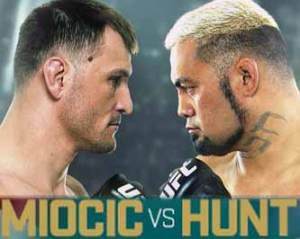 Review by AllTheBestFights.com: 2015-05-10, tough fight but not so exciting: Mark Hunt vs Stipe Miocic gets two stars. The 2001 K-1 World Grand Prix champion Mark Hunt entered this fight with a professional mma record of 10-9-1 (70% ko/tko victory rate – he has never won via submission) and he is ranked as the No.5 heavyweight in the world (currently the #1 in this division is Cain Velasquez). ‘The Super Samoan’ Hunt fought twice last year beating Roy Nelson (=Hunt vs Nelson) but then he lost to Fabricio Werdum (=Werdum vs Hunt). His opponent, the 32-year-old Stipe Miocic (9 years younger than Hunt), has an official record of 12-2-0 (75% finishing rate) and he entered as the No.9 in the same weight class. He fought three times in 2014 winning over Gabriel Gonzaga (=Gonzaga vs Miocic) and Fabio Maldonado (=Miocic vs Maldonado) but then he was defeated by Junior dos Santos (=dos Santos vs Miocic). Hunt vs Miocic is the main event of UFC Fight Night 65. Watch the video and rate this fight!